Eggs in purgatory are eggs served in a delicious, rich and spicy tomato sauce. 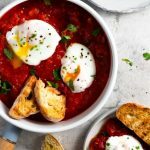 In this recipe, I use poached eggs and made a simple and super quick tomato sauce that you're sure to love. Served with slices of crusty char-grilled bread, perfect for dipping. Heat a little olive oil in a large pan and add the garlic, chilli, fennel seeds, and paprika, fry for a few seconds until fragrant. Add the canned tomatoes, tomato paste and a little water, stir to combine and let it simmer for 8-10 minutes until reduced and thickened slightly. Season well with salt and pepper. Once the sauce is ready you can start the eggs, make sure to keep the sauce on a low heat or warm up just before serving. Meanwhile, bring a large pot of water to a boil and crack the eggs into individual ramekins (or do one at a time). Turn the heat off the water so it's no longer boiling and carefully drop the eggs one by one into the water. The best way to do this is to lower the ramekin enough so the edge is touching the water then drop it in. Let the eggs poach in the water for 4-5 minutes then remove with a slotted spoon and pat with kitchen paper to remove excess water. Add the eggs to the warm sauce and serve with toasted ciabatta slices and scatter over fresh parsley. You can also poach the eggs in the sauce if you prefer. To do this cook the sauce as instructed above for 2-3 minutes until piping hot then make four wells in the sauce, crack the eggs into the wells and partially cover for 5 minutes or until the whites are cooked and yolks still runny. If you choose to poach the eggs either in water or sauce make sure you use the freshest free range eggs you can get your hands on. The fresher the egg the better the results and flavour! Toast the ciabatta bread ahead of time. Cut the ciabatta into slices and drizzle each side with olive oil. Heat a large griddle pan and toast on each side until crispy and slightly charred, sprinkle with salt. Adjust the heat of the sauce by adding more or less chilli. You can also add red pepper flakes instead of fresh chilli. After cooking the eggs (whatever way) spinkle a little salt and pepper on top of each yolk to season. Use high-quality tomatoes for best results. This really will make the biggest difference so don't skip this tip!